If you found this analysis then you might enjoy using CreateDebate. We built our site from scratch and our community is growing quickly! A debate about The Seven Habits of Highly Effective Internet Users is already underway. Click here and check it out! Recently, I came across a debate handbook written by Alfred C. Snider of the University of Vermont. The complete text can be found here. I read through it with an eye for concepts that could be applied to online debate. One of the best takeaways was The Code of the Debater (albeit, its somewhat cheesy). I’ve reprinted it below. In the web 2.0 world of user-generated content, I think that guidelines like these make a whole lot of sense. Whether you prefer to debate in the comments section of Digg, in the self subreddit or on CreateDebate, try to keep these guidelines in mind. You will be more effective in expressing your point and your reputation will improve. I will remember and respect where I came even though I am now a citizen of the world. I will respect my partners, opponents, judges, coaches, and tournament officials. I will be honest about my arguments and evidence and those of others. CreateDebate has a new debate format! We just added in challenge debates to our lineup of the standard 2-sided and popularity debates. Now you can challenge your enemies or allies to a debate between just the two of you for a faster paced, more one-on-one competition. Just go to the profile page of the person you want to challenge, and click the “Challenge to a debate” link to get started. We’re thinking of expanding challenge debates in the future depending on feedback to include some other possibilities, like live debates with a more chat-like feel, wagering your user points in the challenge so the winner takes all, or expanding the challenge format to make it easy to create group debates. Take a look and let us know what you think! I just finished reading an interesting essay entitled How to Disagree. Written by Paul Graham, the essay introduces and describes a seven-level Hierarchy of Disagreement. From name-calling to carefully reasoned refutation, Graham breaks down each level of the hierarchy with a brief explanation. I completely agree with Graham’s theory but I have to disagree with him in one critical area: his use of illustrations (he uses none). Bam! Graham’s Hierarchy of Disagreement has been Maslowtized. Visual-learning works great for many people and I thought it would be helpful to represent this theory graphically. When you are using CreateDebate, the goal is to write strong arguments (funny ones welcome too, sometimes). You will write stronger arguments if you think about this graphic while you write. 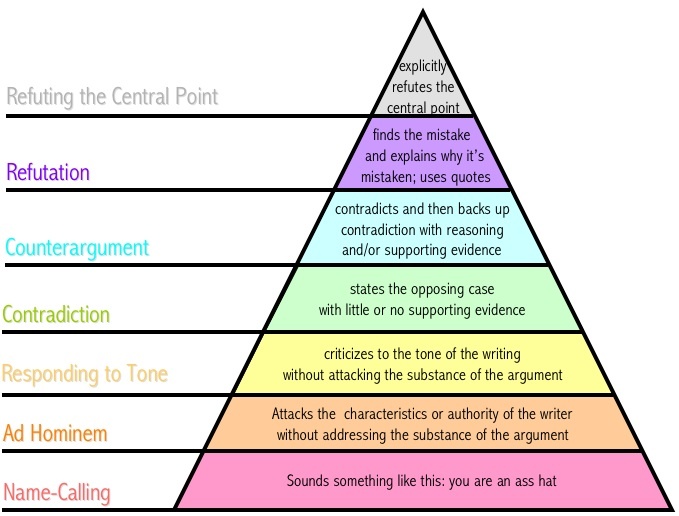 As you browse the site and read debates, try to mentally classify the arguments with the most points. Which level do they reach? Graham postulates that all arguments falling below Contradiction are unconvincing. You may come across popular arguments that are intellectually dishonest. Vote them down or respond: use your pin to pop those balloons. As you craft a response, do your best to explicitly refute the central point of the argument. In most cases, that will require thinking of something better than that’s what she said. The web is giving you an opportunity to respond to the world. Take advantage of this opportunity.